I heard about the Rapha Festive 500 early on in my years as a cyclist; it is an elite challenge meant to test the limits of one’s physical fitness and mental fortitude over the course of 8 days between Christmas Eve and New Year’s Eve. To participate, one must ride 500km during that time period. In return for one’s bravery, Rapha sends each finisher a “roundel” so that they may have an object to drive them forward during the cold, dark days they have chosen to pedal through instead of merely lounging around at home. 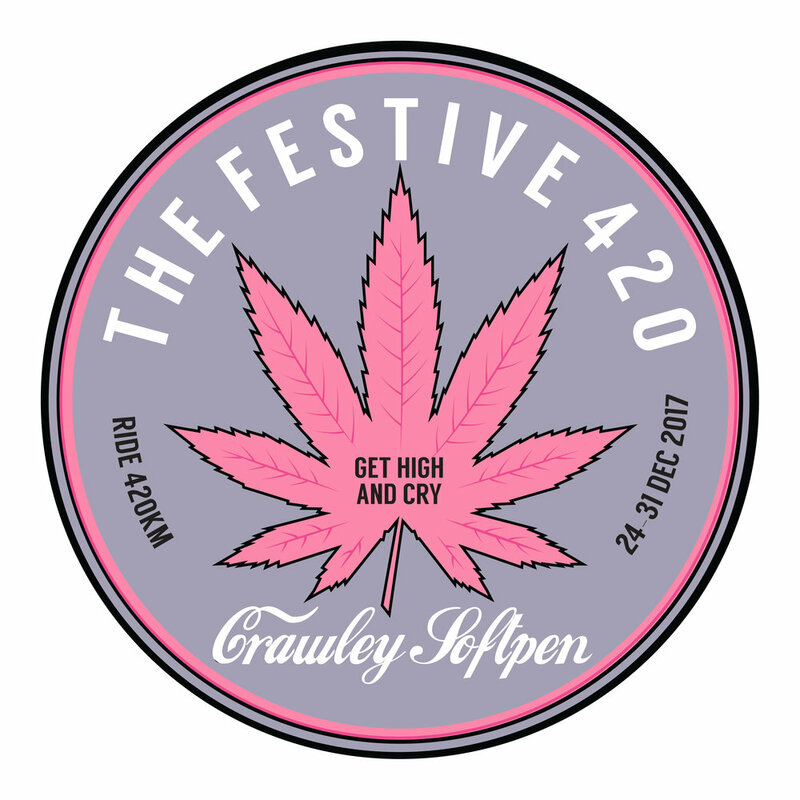 In 2017, I had some spare time on my hands and decided to create a parody of the Festive 500, that I dubbed the Festive 420. The idea was simple: if one could cut 80km out of the challenge, would that make it any easier to complete? I really wanted to highlight the idea that this challenge, while extremely impressive, was ridiculous. It’s a time of year that one wishes to spend with loved ones, in stretchy pants, eating and drinking (and smoking?). So, I set about drawing up a patch, taking design cues from the original Rapha Festive 500 patch. Though I chose to spice it up a bit, playing up the idea that this was meant as a counterculture take on the classic holiday challenge. I posted it on my Instagram with a “witty” caption and went to bed. The next day I woke up to 300 notifications on my phone (that’s not normal, not even close). Somehow, the design had been picked up by someone on social media that had a following of people who rode bikes and apparently felt similarly about the whole Festive 500 thing. Requests to make the patches a reality filled my DMs. Using that as encouragement, I decided to move forward with the gag and have the patches made. I would send them out to everyone for free, just like Rapha. I ordered 250, thinking I’d be sitting on 200 of them for the rest of my life. When it came down to it, I had about 5 that I kept for my family, and the rest found homes across the globe. I sent patches all over the U.S., to Italy, the U.K. (one even landed on the desk of the creator of the Festive 500 at the Rapha office in London), Australia, Belgium, Germany, and Canada. This little project, that I thought was a ridiculous and, frankly, stupid turned into something that I really took great pride in and enjoyed very much. I was beyond stoked that people connected with the idea and that I was able to stoke people out at a fairly minimal cost to myself. And with something I designed and created myself, no less! I decided that I would do it again for 2018. I had many repeat participants, some of whom have become strong acquaintances on Instagram thanks to the first year, and gained quite a few new folks as well. I ordered 300 this time, and have about 50 left.